We have had a couple of glimpses of the Australian Estates Company Limited No 1 wool store earlier in this blog - once to discuss its WWII use by the US contingent in Brisbane, and on another occasion the fabulous Vice-Regal Ball in honour of the Duke and Duchess of York held there shortly after its opening in 1927. Both of those posts were about the original Australian Estates wool store at Teneriffe. 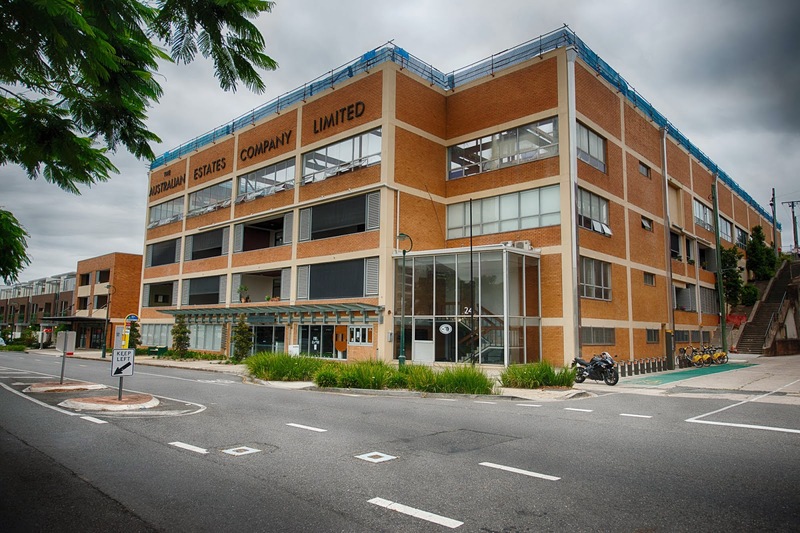 Today we are looking at the Australian Estates No 2 wool store, a four-storey construction built into the side of Teneriffe Hill next to its sister building in the late 1950s. Things had changed in the thirty years since the first of these two buildings was erected. Wool was at its financial peak in the boom period immediately following WWII, and this new wool store was of a fresher, more modern design than the earlier ones in the area. When it was completed Australian Estates used it as a showroom where buyers could take advantage of the abundant natural light to assess and bid for the bales of wool. However mechanisation was already replacing manpower and this wool store was destined to be the last of its kind. 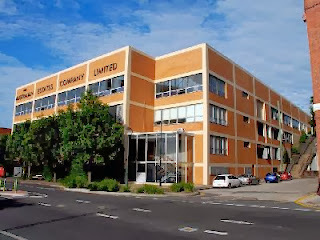 In the 1990s the Brisbane City Council commenced its urban renewal plan that intended to convert industrial Teneriffe into a residential area. All the wool stores, including this one, were rezoned for residential makeovers that have transformed the suburb. This one had its four floors converted into 36 apartments. But the increasing demand for homes in the area led to a decision to enlarge the former wool store. This has been achieved in a unique fashion by lifting the roof off the building and adding a further nine apartments. The beginning of the transformation can be seen in the following photograph. The process that will add exclusive residences to this heritage listed building can be seen on the developer's web site. The views to the river and also back to the city should be fantastic. As always, I am ambivalent. On one hand I most definitely want historically important architecture to be re-purposed and not destroyed. This is particularly so because of the importance of wool to Australia's lifestyle and economy for many decades. On the other hand, once the Brisbane City Council commenced its urban renewal plan that converted industrial Teneriffe into a residential area, it might have meant open slather to private developers. Could the building not be used for state or federal government services? Some of these buildings have been reused in this way. I know one became an archives storage area for a time. But I think that they have become so valuable that governments are reluctant to purchase them. The current council also seems ready to amend legislation at the drop of a hat to enable the completion of more multi-storey apartment blocks. Old movie films - who was the photographer?